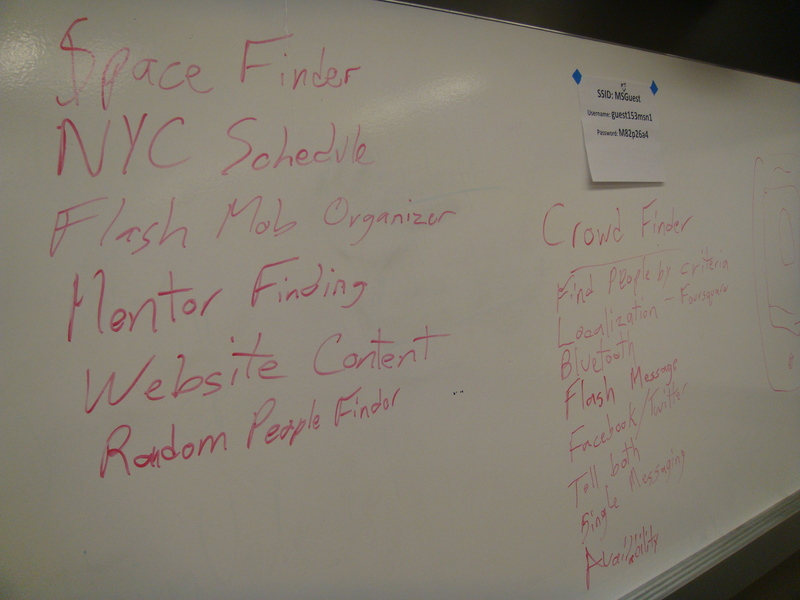 This past weekend, I attended the fifth annual BarCampNYC, an international unconference where the attendees design their own panels and attend them. I decided that I wanted to try an experimental panel about designing an application from the ground up. My plan was to go in with a clean slate and see what people came up with. 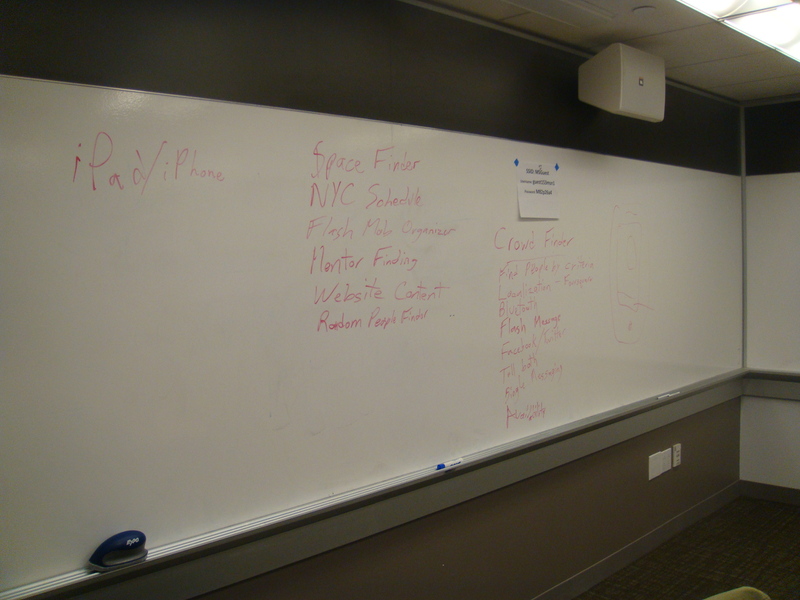 The way an unconference like BarCamp works is that attendees show up in the morning and write the name of their proposed panel on a piece of paper and place it on the wall in a room’s time slot. The number of panels at the beginning of the day tended to be sparse at BarCampNYC, but as the day went on and the attendees woke up or arrived late, the grid filled out with interesting talks about Arduinos, business, networking, game programming, food and other topics. 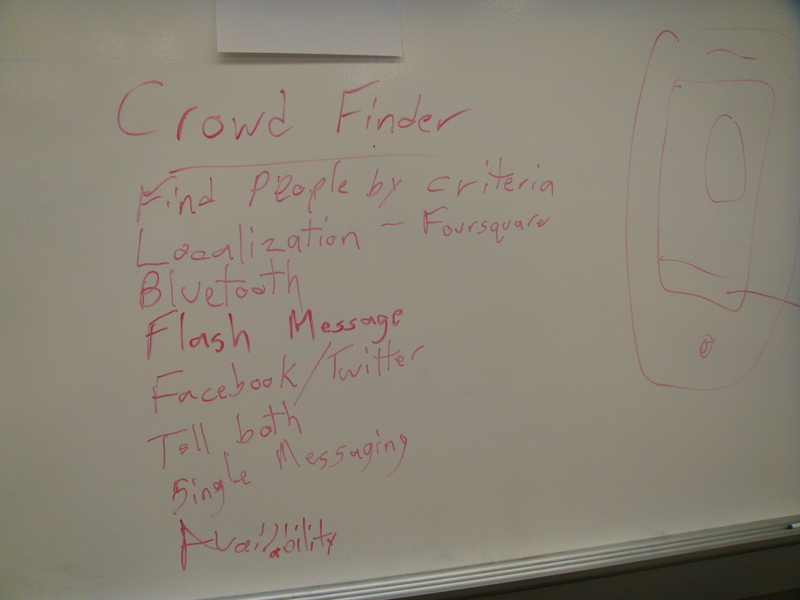 I chose to place “Crowdsourcing an App Design” in a slot after lunch. My plans was just to walk in and see what people would come up with and try to spur on ideas, and if people came up with something plausible, possibly try to build it after the unconference. I think people weren’t sure exactly what the panel would be as the unconventional method of design was presented, and some people left to investigate other panels once I explained what I was doing. To be fair, I was going on an idea that I had had a day or two previously and unlike a lot of attendees, I didn’t bring a powerpoint, video or any other presentation materials, just what I thought was a cool idea. The first point was to decide what platform to design for. One attendee objected with this as the first point, but I felt that it was where I wanted to start. I knew that it was a tad different to do it that way, but wanted to use it as a point of focus to channel the discussion. I had a feeling that mobile was going to be the most popular choice, since the iPhone and iPad apps are the most popular in general. My hunch was correct and became the platform of choice. Once our platform was chosen, we began the discussion of what the app should do. This created a discussion about how people in New York City interact with each other and how they are unsociable and how to find and meet new people. Whether it be in groups, finding a mentor or just trying to find the people around you who may have similar interests. Our decision became a localized social application to communicate with those around you, either one to one or as a group. Once we figured out what it would do, we needed to figure out technical details. The group messaging would be based on the idea of a flashmob idea and be able to send to everyone within a localized range, while the individual messaging would let you talk to local strangers based on preset criteria, like interests and hobbies. The app would need to be able to use bluetooth so that it works underground for the subways here in New York in addition to the usual cellphone and wifi and would be able to send notifications to your social networks, since that’s de rigueur. Overall, I like the ideas that we came up with in the panel and want to build this app. I think there is some definite potential to this application and can’t wait to see how it works out. I hope to start work on it very soon and put the first prototype out for testing. The panel we designed this in was a little rough, but now that I know how it worked out, I can fine tune it and potentially do it again at another conference and see what people come up with next time.